It is a curious thought, but it is only when you see people looking ridiculous, that you realize just how much you love them. An archaeologist is the best husband any woman can have; the older she gets, the more interested he is in her. Never go back to a place where you have been happy. Until you do it remains alive for you. If you go back it will be destroyed. Perhaps a little of Trollope, but not to drown in him. One doesn't recognize in one's life the really important moments — not until it's too late. Everything has got its right size. When it is its right size and well run it's the tops. I specialize in murders of quiet, domestic interest. Nothing, I believe, is so full of life under the microscope as a drop of water from a stagnant pool. It's so dreadfully easy—killing people… And you begin to feel that it doesn't matter… That it's only you that matters! It's dangerous—that. It's astonishing in this world how things don't turn out at all the way you expect them to! Oh, dear, it's quite true what Dr. Reilly said. How does one stop writing? If I could find a really good telling phrase... Like the one M. Poirot used. In the name of Allah, the Merciful, the Compassionate... Something like that. 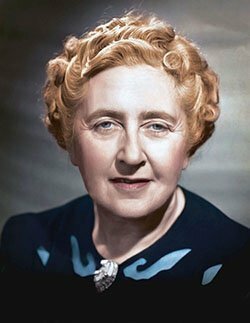 Bio: Dame Agatha Mary Clarissa Christie, Lady Mallowan was an English crime novelist, short story writer and playwright.